We were an interesting statistic. Not completely rare by the early 90s but certainly not common either. We ticked all the boxes required for an unusual family unit- the single parent mother to three mixed race children and living in a sleepy Suffolk town, boy did we stick out! We don’t really look like siblings and we were most definitely a talking point amongst the locals for some time as they gossiped and debated our parentage – even now people still say to me “you don’t look like your mum”. How she managed to keep her cool I do not know; as if trying her hardest to raise us well on her own wasn’t enough but we can laugh about some of those situations now, it was all a bit The League Of Gentlemen, if you know what I mean! She grew up a “latch key” kid, whereby my grandparents, both out at work or otherwise occupied would leave them all to their own devices (and there are some hilarious stories to be heard about that). They were an RAF family and moved about a lot. Mum didn’t make a lot of friends as a child and got used to not settling for too long. Perhaps that’s why, when she had us it was so important for her to create a permanent and secure home environment, particularly as a single parent. Mum helped to shape how important home is for my own family now. Home for us was a very small two-up/two down Victorian terrace. It wasn’t anything like what my friend’s grew up in but we loved it nevertheless. I shared a room with her until I was fourteen with my younger brother and sister in the other. We didn’t have much, so she made the best of what she could. She made curtains, hung her own shelves, painted and wallpapered and still found time to knit us the odd jumper or sew a new dress for summer. Looking back over some of my old childhood photographs, I spotted plants in most of them, so I know where I got my love of urban jungles from! 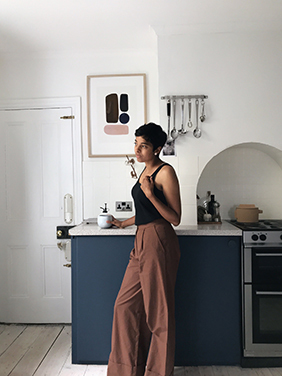 She is without doubt predominantly responsible for my deep love of interior style today, proving that a beautiful home can be made from a small budget. The art college graduate never completely left her in her creative endeavours to encourage us to explore and make. We were allowed to make a mess, build dens in the wood, spend all afternoon baking or whatever it was that had our attention at the time (I used to enjoy sucking lemons. No. Really). She taught us to laugh (mostly at each other) and not to take ourselves too seriously. She introduced us to Stevie Wonder, Ella Fitzgerald and Marvin Gaye and didn’t mind when I chose to belt out The Prodigy through the house. If there was something we wanted to achieve, she encouraged us to go out and get it. I’m extremely thankful to her for putting so much of her life on hold to give us the best she could, especially now that I have children of my own and am lucky to have my career with the support of my husband, Rob. Mum has always had a ‘feel the fear and do it anyway’ kind of attitude towards life, even though I’m sure she’d play it down. She learned to drive in her late 30s, studied hard to become a primary school teacher and most recently ran the Brighton Half Marathon in just over 2 hours. Nothing short of brilliant and proof that it doesn’t matter where you come from, you can do it when you set your mind to it. Lovely, thoughtful essay; it’s good to hear adult children recognize the positive aspects of family and especially truly understand what their parent(s) were trying to give them. Thank you for writing this and sharing. Hi JoAnna, thank you for stopping by. I think about it more and more now that I have my own, how lonely it must’ve been for her at times. I count myself very lucky!